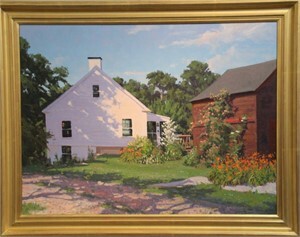 David P. Curtis grew up on Cape Ann, an area noted for its rich artistic history. 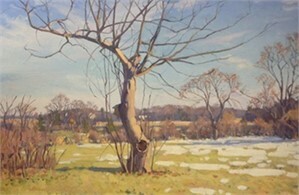 Introduced to painting at an early age by his artist father Roger W. Curtis, David attended weekend classes at the Massachusetts College of Art, and received critiques from artist Ken Gore. Graduating high school, Curtis spent the summer of 1968 studying at the Boston Museum School, and in the fall, Vesper George School of Art, Boston. In January 1969, he began working under Boston painter R. H. Ives Gammell and remained with him until June 1971. Curtis returned to Gammell in the latter part of 1974 and remained in the atelier until the following year. Curtis also studied part-time with Robert Douglas Hunter. Curtis is an artist member, and past member of the Board of Managers, of the Guild of Boston Artists; an artist member and past Chairman of the Arts and Exhibition Committee of the North Shore Arts Association, and an artist member and current President of Rockport Art Association. Primarily a plein air landscape painter, Curtis has been instructing outdoor oil painting classes and workshops on Cape Ann since 1993.